If you are standing upright, don't worry if your shadow is crooked. A rugged piece of Nature's art! Beautiful! MMT this is once again a beautiful subject shining in the desert .. waiting to be captured. A wonderful piece of art where there is no studio to clutter it .. only the vast desert that enriches it. Your use of "sentinel" struck a cord for me as a Canadian and as a military wife since November 11th is our Remembrance Day .. far too many wars and conflicts add far too many soldiers to the list of the lost. You find the most beautiful 'sculptures' out there in the desert and then pair it exquisitely with words! I have to repeat what Paula has written, you do find the most amazing and beautiful sculptures in the desert and your words are equally beautiful! Have a great weekend!! The shadow is subtle and set of my the gold. How ironic that your words struck a note for a warrior's wife just at the right time! Some would call that serendipitous, others would deem it the work of the Spirit. Today being Veteran's Day, was this intentional? Whether it was or not, aptly done. 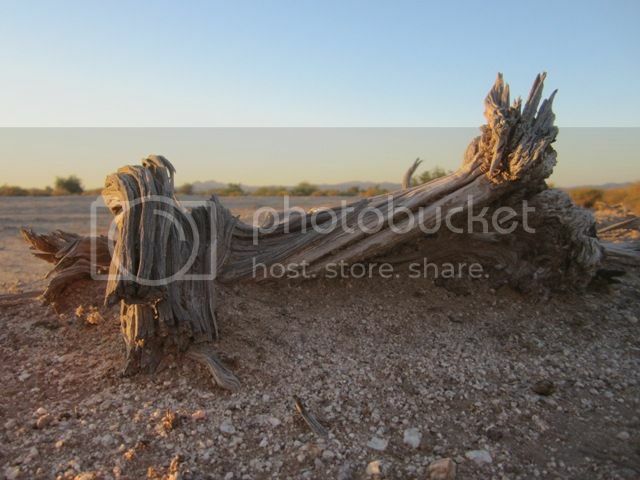 I enjoy how you see the desert as more than arid with little landscape except cacti and whatever the wind blows there. A marvelous example of mother nature's art. Even in decay there is beauty. Very nice shot! I'm listed a 2nd time because I wanted to see if I understood your directions. Thank you so much for your patience and precise directions! yipee, it worked, right? Love your photo and Haiku. Lovely photo and haiku, Gemma! I never really appreciated the beauty of the desert till I moved away from it. I often find myself longing for it these days. What a lovely piece...a beautiful reminder of home to me! As always...your haiku is perfectly paired. Beautiful shot, interesting twisty piece of wood. A beautiful picture, I like the light and poetry in their ways. Love this post and picture! !